PairSquared: How is MJ doing? Glad you asked.....well not too bad. I have a chance to now give you more details on what I know as this pregnancy has progressed thus far. We found out we were pregnant in October. 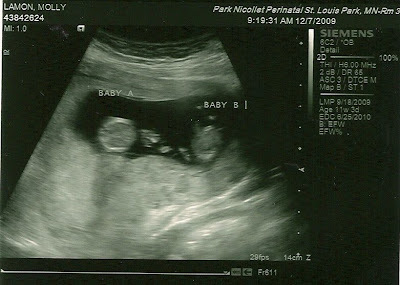 The first test I took was negative, but I didn't really believe it because I felt pregnant (ie: sick). Two days later our fate was sealed. To answer your question, yes we were hoping to have a third child. It was decided for us that we will have four. Brett and I were feeling pretty confident in our parenting of two and thought that one more would be the last ingredient for our family. We decided this before the entire family came home from New Mexico and got the dreaded H1N1. We were sick! Then the truth came out....maybe we should hold off on that last one for a little while yet. NOW you tell me! Too late, it was already done. I do believe that it was meant to be this way. We didn't get the flu before we were supposed to. We found out at week 6 that we were having two! So the official due date is June 25th, but they won't let me go later than June 10th. I am shooting for June 1st. Yes, that would make the two sets of twins 14 months apart. And yes, we are crazy. So far this pregnancy has been a little different. The biggest thing I have noticed is that morning sickness has become all the time sickness and it kicked in at week 4 and continues to linger around. I am at week 13 by the way. There are some other differences, but I don't think they are appropriate for my blog. Our care was transferred again to the perinatal clinic at Methodist Hospital under the direction of Dr. Pratt. She was the boys doctor after we were put on bed rest. Dr. Pratt gave us an educated guess on "what are the chances of our situation" and she came up with 1 out of 100,000. The ultrasound at this appointment showed everything looking pretty good. They are measuring on time and at the same rate. They also measured my cervix which is normal length at this time, but we were scheduled that day for surgery. Good news is that surgery is over. I got my cerclog last Wednesday at Methodist Hospital. This time it is preventative instead of rescue so the hope will be that I won't have to be on bed rest. This set of twins are however identical so that comes with its own set of risks. Sounds like the biggest one is Twin to Twin Syndrome. This basically means that if two babies share a placenta there is a chance that they can start growing at different rates ie: one thriving and the other one struggling. This only happens in 15% of the identical cases. I have to go in every two weeks to get the babies measured and also for a cervical measurement. Either way I was doomed to be at the clinic a lot. So today we are 13 weeks and 3 days. I have an appointment on Wednesday right before we head home on Christmas vacation. I am going to see if we can figure out the sexes earlier than the normal 20 weeks so say posted. I'll update when I know anything. Ethan and Bennett can't wait for more babies to play with. They have really started to play with each other which usually involves some pinning on the floor, toy stealing, and hair pulling. Bennett is our bully. I have a video that I will post later. Both of them are crawling. They haven't taken off to explore the entire house yet. They both can go from a laying to sitting position ad Bennett just figured out how to pull himself up to a standing position today. We caught him standing at the exersaucer. Papa and Nana were here to witness that mile marker. The boys continue to eat and sleep well. I feel like making baby food is never ending. Brett and I are doing great. He continues to be a supportive husband to a some times emotional pregnant wife. Brett loves being a dad and is very helpful with the boys which is especially important given the reduction of my energy level. I am really looking forward to the holidays and our birthdays are coming up.